This week, two videos from a recent TechBall match that took place at a SeTechnic meeting last July. A few more taking place within other LUG events, can be found also at YouTube if you search for TechBall. TechBall is a competition where a kind of football for vehicles, takes place. The objective of the game is that each player tries to capture the ball and introduces it into the opponent's goal. Its popularity has been increasing among several LUGs and it is specially interesting for organizing at the LEGO club events, for amusement of everybody. Build a Technic MOC capable of participating in a TechBall competition, a kind of football for vehicles. Each vehicle will be remote controlled without cables (PF, manas, Spybot, RCX, NXT...). The ball will be the TECHNIC Ball 52mm (Peeron 41250/x957, BL x211). The maximum size of the vehicle at any time (before and during competition) is 20 studs by 20 studs. There is no limit to the height. The motors will only be used for the propulsion of the vehicle. The ball may not be manipulated in any way other than by the movement of the vehicle. It may not be grabbed or lifted either. Inclusion of a maxifig is optional, but recommended. Each match will have a duration of 3 minutes. The objective of the match is to introduce the ball into the goal of the opponent. The starting position for each participant will be inside his own goal, with the ball in the center of the field. After scoring a point, the match will continue from the starting position. The playing field will have a border with a height of approx. 5 cm. On either side of the field a goal area will be clearly indicated (for example by two stacks of tyres - Peeron/BL 32019). The objective of the game will at all times be to play the ball. Any attempts to damage your opponent's vehicle will be punished by immobilizing your vehicle during 5 seconds. Any attempt to interfere with the frequency of an opponent will result in immediate disqualification. Each participant will play against each one of the others. The winner will be the one to have gained the highest number of points at the end of the series of matches. In case of a draw there will be a final game that will follow the same rules as the other games. If after the established time has elapsed there is still a draw the game will end in sudden death: the first one to score is the winner. If the number of participants is too high to use the first method, two groups will be made by drawing lots. Each group will compete according to the description under number 1. The winner of the first group will play against the winner of the second group to establish an overall winner. In order to make the identification of each participant easier, color combinations may be 'claimed'. No vehicle will be only black or light gray. If you claim a color you thereby commit yourself to presenting your model in the forum before the competition. Below a few links taken from Brickshelf, with several examples of TechBall cars, including both Dual Differential Drive (DDD) and Differential Drive (independent double motor) drivetrains. Peer Kreuger's (mahj) ChairBall (as he called it) - The actual LEGO Ambassador for LowLUG. 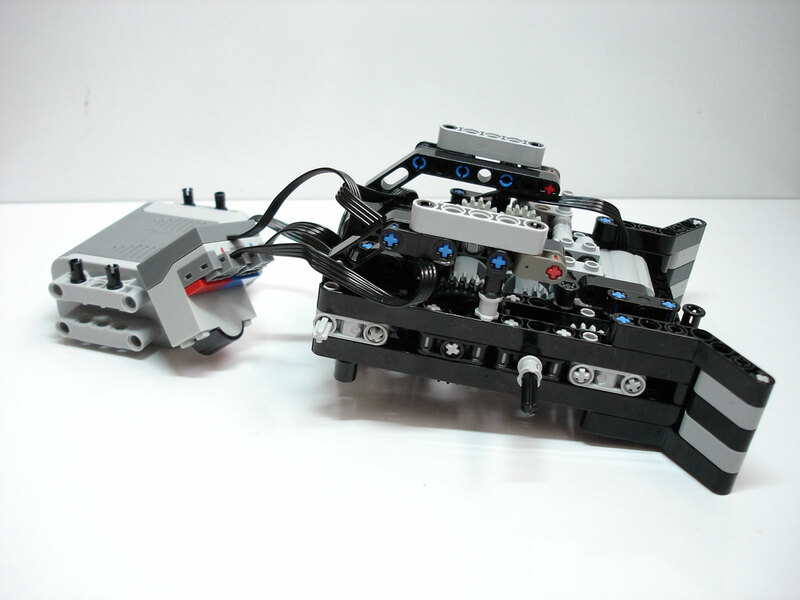 Dual Differential Drive vehicle from jovel, another LowLUG member. Steen, presents us three TechBall variation cars. Respectively the NXT, PF and RC versions. And finally Sariel and his LUGPol friends, TechBall vehicles. Build yours and enjoy it together with other fellow LUG members, at your next event! Anyway, regarding TechBall, that's something I would definitely love to try! But I see a possible difficulty for those using the 8539 Manas motor: the rules specify a maximum width of 20 studs, and the motor has 18... some creative workarounds have to be though about to use wheels othr than the narrowest ones. But then again, this isn't just about putting the ball inside the opponent's goal, it's also designing the means to do it! Tere was no other appropriate entry at the time, to make this comment.